This is the most perfect cookie ever created. I don’t know if it’s just me, but I’ve never successfully baked a pecan pie. Okay, I think it probably is just me, but sometimes you want pie and you don’t want to go to all the work to get said pie. Let’s face it: pecan pie is kind of the drama queen of the dessert world. Here’s the beauty about this little cookie, if you don’t want to make your own pie crust, you don’t have to; you can use a premade one. If you want to make your own pie crust, you can make it extra buttery, extra flaky, extra vanillay. You can do whatever your heart desires with this little cookie. Just don’t skip the chocolate drizzle. It’s necessary—just trust me. 1. For the crust, mix together the flours, sugar, and salt. Stir in the butter, vegetable shortening, and cold water. Once blended, divide it into two balls, cover in plastic wrap and refrigerate for 15 minutes (makes rolling easier). 2. Preheat the oven to 375 degrees. In a medium saucepan, combine vegan butter, brown sugar, corn syrup, maple syrup and salt. Cook on medium heat until the mixture starts to bubble. Stir in pecans. Remove from heat and set aside. 3. Take your pie crust out of the fridge and roll out until about 1/8-inch thick. Using a three-inch cookie cutter (I used one with fancy scalloped edges because it’s the first three-inch one I actually found), cut out shapes. Combine dough and roll out as necessary, until you have 24 circles. 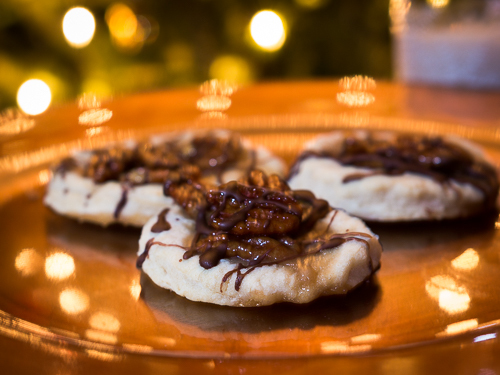 Fold the edges around the tiny crusts, so the pecan filling can “sit” in them. 4. Line a baking sheet with parchment paper and place crusts on sheet. Spoon filling onto cookie (not too much or it’ll run over), just enough to “fill” the spot. Bake for 10-12 minutes, or until edges are light golden brown. Remove and cool on a wire rack. 5. Once everything is cooled, microwave vegan chocolate chips in a plastic food storage bag (only took about 30 seconds in our microwave). Cut a tiny tip off the corner of the bag and use this to drizzle over cooled cookies. Allow chocolate drizzle to set; I placed in the fridge for about five minutes. Take them everywhere and show them off, because not only are they delicious, they’re super cute, too. 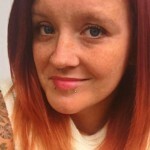 Amanda is the managing editor for a website design and development agency and a graduate of Notre Dame College. She’s been vegan for nearly a decade and enjoys making cruelty-free sweets and easy, delicious dinners. When she’s not concocting something in the kitchen, she can be found hanging out with her vegan hubby, daughter and toddle, coaching a feisty group of softball players, and blogging at Chubby Vegan Mom.